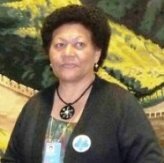 One White Poppy Peace Scholarship was awarded in 2016, to Ema Golea-Tagicakibau, please scroll down this page for information about the recipient's research. Ema is a Doctoral candidate in the Department of Political Studies, Faculty of Arts, University of Auckland. Her research is titled 'Gender and Militarization in Fiji' and will be completed in 2017. Ema's thesis examines the shifting construction of gender (and intersectional relations such as ethnicity, status, class, sexuality and religion) in the militarization of Fiji over the coup decades between 1987 and 2007 in Fiji. The key research questions are: how gender (masculinities and femininities) and other intersectional relations and identities are constructed in the militarization of Fiji; the role of women in the shifting constructions of gender during conditions of militarization; and what lessons they can offer. The overall goal is to examine the impact of militarization on women in Fiji, from a feminist intersectionality theoretical approach. The two key objectives of the research are: to investigate the construction of gender and intersectional identities and relations (such as race and ethnicity, status and class, religion, age, sexuality, ability, etc) in the militarization of Fiji during the coup periods between 1987 and 2007; and to examine the role of women's agency, that is, how women have responded under conditions of militarization in Fiji.